/ Noisefoc - leaf-audios Webseite! Some years ago we made a library for Ableton Live, based around Noisefoc sounds. You can download it here and back then we also made a demo song with it, check the Soundcloud player. Noisefoc is controlled chaos! And it's brilliant (who would have guessed it) for noise sounds. 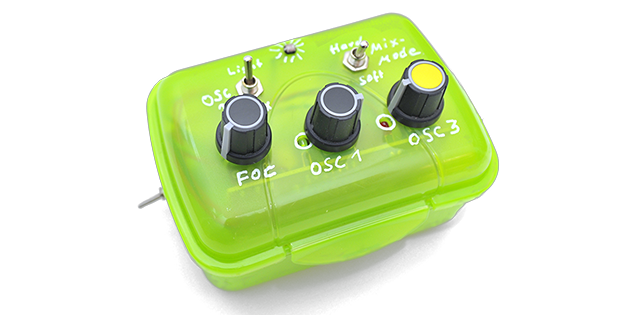 It had countless incarnations - from the plastic box version to a pimped version as Eurorack module. Nowdays we mostly offer the Eurorack version in the workshops, but from time to time we still do the boxed version for kids workshops etc. Noisefoc is a great learning project. It is based around three CMOS NAND gates as oscillators, controlled by potentiometers and a light dependent resistor (LDR). There's an optical feedback of the frequencies via LEDs, two mixing circuits to mix the oscillators and a power starving function which makes the device completely out of control. 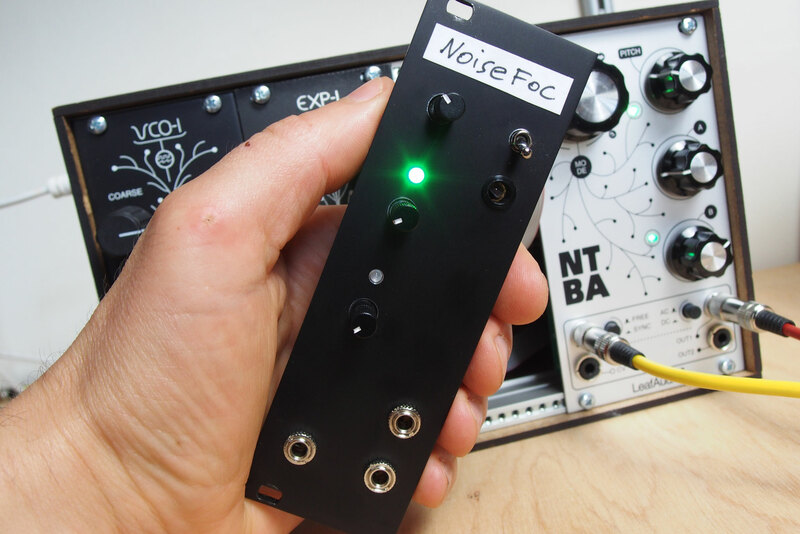 The Eurorack version features a CV input for pitch influence via optocoupler. In general, it offers many opportunities to understand the technology behind it, as well as possibilities of hardware hacking.